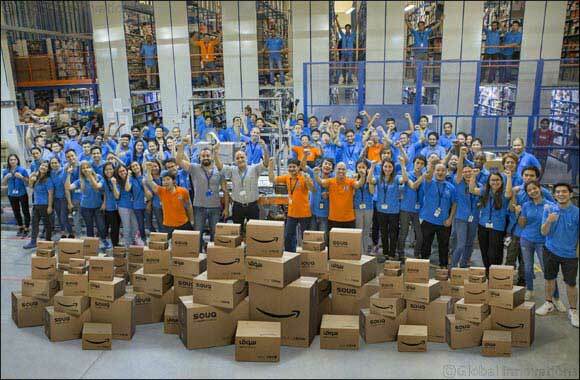 20th November, 2017, Dubai, U.A.E: SOUQ.com, the online retail and marketplace in the Middle East, has integrated some of parent company Amazon's (AMZN) processes and systems to further strengthen its robust delivery operations ahead of White Friday, its biggest online shopping event in the region. SOUQ's annual White Friday sale is set to take place from Wednesday 22nd November to Saturday 25th November, and will offer customers across the GCC and Egypt deals to match the lowest prices in the region on more than five million products. In line with Amazon’s core principles that focus on customer obsession, invention, long-term thinking and operational excellence, SOUQ has invested heavily in operations by expanding its Fulfillment Center (FC) facilities, upgrading technology, increasing resources and adding pickup points, to prepare for the high volume of orders expected during the shopping extravaganza. Last year's White Friday event recorded the highest-ever sales of 1.2 million items. SOUQ expects this year's shopping frenzy to be another record-breaking sale, which is why the company has increased its warehouse footprint to load up millions of extra items across the region as part of its Fulfilled by SOUQ (FBS) program that brings greater selection and convenience to customers. The FBS program extends services currently provided by the e-commerce platform to all its merchants, enabling them to effectively fulfill their delivery orders. SOUQ has also added hundreds of full-time and temporary FC associates in anticipation of the spike in sales during White Friday, with the centers geared to operate 24/7 prior and during the campaign to ship orders as fast and accurately as possible. In keeping with the platform's vision to innovate and offer the best services in the region, the company plans to run multi-cycle operations across all its sort centers and delivery stations. Hundreds of additional couriers have been hired in different locations to increase capacity for a superior delivery experience. Special teams have been formed to deliver heavy bulky items such as furniture, large appliances and gym equipment. Meanwhile, for the first time, customers will have the option to pay even more conveniently as SOUQ rolls out its credit card on delivery option in the UAE. The company is also launching more pick up points for customers in new locations to collect their shipments during the event. More than 16,000 of the world’s leading brands and companies will be selling their products at unbeatable prices and offering special deals during White Friday 2017 including Samsung, Du, Mobily, Lenovo, HP, Xiaomi, OnePlus, Infinix, Hisense, Huawei, Reckitt Benckiser, P&G, Unilever, Pepsi, Nestle, Phillips, L’Oreal, Henkel, Nike, Aldo and many more.